"The Origin of the Justice Society America"
Chang Tzu is selling a captured Black Adam to the highest bidder as the Justice Society arrive at Oolong Island to free Adam and take him into JSA custody. They're confronted by the Great Ten, China's super team, and told that Oolong Island is part of China. If the JSA set foot on the island, it will be considered an act of war. Meanwhile, Chang checks on Dr. Will Magnus's progress with his Plutonium Man and explains his Responsemeter technology to Chang including the fact that the Responsemeters pretty much do all the work in creating Metal Men themselves so Chang Tzu wouldn't have seen anything funny in watching Magnus. Certain metals that came into Magnus's lab never left it. That's because those metals went into the creation of Magnus's mini-Metal Men who attack the giant sentient egg-like creature. Outside the JSA try to convince the Great Ten that they don't represent any one nation but the Great Ten refuse to budge and insist the JSA will be committing an act of war if they try to take Black Adam. It appears one of the Great Ten members may be using telepathic abilities to tell Green Lantern the truth about Oolong Island. However he knows, Lantern says that Chang Tzu is a member of the Great Ten. Meanwhile, Magnus tries to take down the force shields. Professor Morrow shoots Mercury and tells Magnus to stand down. Magnus refuses and offers Morrow a teleport link to Dr. Sivana's omnibot suit in geosynchronous orbit around the Earth. He tells Morrow to disappear in the confusion of the fight. He lets him go out of some sense of scientific loyalty to his mentor. Sivana searches for his teleport control fruitlessly as Black Adam lies trapped on Sivana's torture table. Outside Green Lantern continues. He tells everyone that Oolong Island was a stronghold of the Red Chinese government dating back years. Chang Tzu and his crew used Intergang money to develop weapons designed to assassinate the Black Marvel family. Black Adam wasn't intended to survive the attack and the Great Ten have come to kill Adam rather than let any of this information get out. Suddenly the shields come down, Green Lantern says the JSA is going in for Black Adam but is leaving Chang Tzu to the Great Ten. Inside Magnus shoots Chang Tzu with a bullet made of mini-Lead and cracks him open like an egg. The super villains scatter. The JSA enter and Magnus surrenders himself to them. Atom Smasher gets Sivana to reveal where Black Adam is being kept and smashes into the lab to retrieve him. Albert tells Adam he's taking him into JSA custody. Black Adam insists he won't stay in their custody while his family's killers are loose. Black Adam flies off with every intention of beginning a war. Meanwhile, in Metropolis, the remainder of Lex Luthor's Everymen consider how they can continue to be heroes now that Lex and the project has been disgraced. Nuklon says they just need a chance to show the world what they can do. The final panel shows Black Adam, poised to change the world. The Justice Society of America is the world's first super team. In their current incarnation, they train the next generation of heroes. Story - 4: How many eggs do you have to break to make a soufflé? Well if you're trying to feed an army, the answer is just one - if the egg in question is Intergang's and the Great Ten's Chang Tzu. Surely this is the moment DC reintroduced Chang Tzu to get to - the egg cracks and the online prognosticators let the egg jokes fly. Well I'm not falling for that. I'm not going to - say it with me people - have egg on my face. OK I'm done. The DCU is on the verge of a world war - again. Depending on who you ask, it's World War III. Though it could be World War IV if you believe Grant Morrison's JLA title of a few years back. Then again it could be World War V if you believe the Imperiex war was a world war too. But that'd probably mean when the "Amazons Attack" in two weeks, that would make it World War VI. So let's just stick with this being World War III. Historians have long studied the minor unrelated events that led up to World Wars I and II and the writers of 52 apparently have as well. It's too bad the separate storylines of 52 don't converge more naturally into a World War especially since it's such a rarity to see the cumulative effect of concurrently running separate story arcs coming together in one story. Usually, separate characters come together in a separate event - like the recent "Infinite Crisis" - and the result is each of those separate characters' storylines comes to a grinding halt so they can participate in the 'event'. This is different as many of the "52" characters haven't interacted in 49 issues and yet are about to merge into one big story as with the end of this issue that foreshadows a smash-crash explosion of the Black Adam and Everyman Project story arcs. Cry havoc, and let slip the Superdogs of war in the DCU! Art - 5: This is the same artist who worked on Issue 44 where Isis died and it's fun to see him take on the Justice Society and the mini-Metal Men. I like Eddy Barrows' work even if his name sounds like he should be a reporter in a 1930s serial or a sailor on the ship in "King Kong". Back-Up Story - 3: This is more of a primer for the current "Justice Society of America" title than a definitive post-"Infinite Crisis" origin for the JSA. Where's the explanation for the effect that the loss of Earth-2 had on the JSA? Back-Up Art - 4: I love the JSA and I especially love those old JLA-JSA multiverse crossovers. Even with Waid's typically ambiguous plotting of these secret origins, I'm totally taken by that first page spread of the Justice League summoning the JSA from the first JLA-JSA crossover. Oh and for anyone who's wondering, I went back to my copy of that first meeting to refresh my recollection and the Earth-One Flash is in fact not at the séance with the rest of the League when they summon the JSA. Whether the artist checked or Waid scripted it from his encyclopedic knowledge of the Silver Age, it's impressive that they got the details of the moment right. Cover Art - 5: Magnus. Will Magnus. 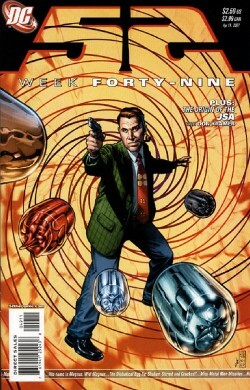 This Bond-ian image of a man off his antidepressants and his band of molten metallic men is one of the more colorful covers of the series and one of my favorites. But why is Dr. Magnus wearing Jimmy Olsen's sport coat?